If you have been considering a beach vacation, and are looking for a truly relaxing experience, your first stop should be Ocean Creek Tennis Villas in beautiful North Myrtle Beach. This resort is nestled in a quiet corner of the Windy Hill area, a group of attractive two story buildings surrounded by palm trees and beautiful landscaping. There is a plethora of swimming pools sparkling in the South Carolina sunshine, and as you might guess, tennis courts, so make sure to bring your racquet. Ocean Creek Tennis Villas is situated away from the hustle and bustle of downtown North Myrtle Beach, so you will always find it quiet and peaceful. However, it does not mean that you will isolated from the fun. After all, the white sand beaches of South Carolina are only a few blocks away, so grab your swimsuit and sunscreen and walk on over. Watch the seagulls swoop and dart from your beach chair, or build a majestic sandcastle as the Atlantic Ocean rolls nearby. The beach is also great for a game of volleyball or a romantic moonlight stroll. And as for the rest of North Myrtle Beach, you will find an astonishing variety of attractions and entertainment to delight everyone in your vacation group. The restaurant possibilities are endless, from waterfront dive bars and family friendly diners to the heights of award-winning cuisine. The fresh seafood here is some of the best that you will ever taste. Golfers flock to this part of South Carolina because there are more than 100 courses in the area to choose from. North Myrtle Beach also has shopping, live music, water sports, and much more. Should you not feel like leaving your resort, you will find plenty of comfort and entertainment. Your two-bedroom rental condo has everything thing you need for rest and relaxation. You can cook a meal in the well-equipped kitchen, and eat it while you watch a movie on one of the flat-screen televisions. There is a washer and dryer in your rental, as well as wireless Internet access, just like at home. 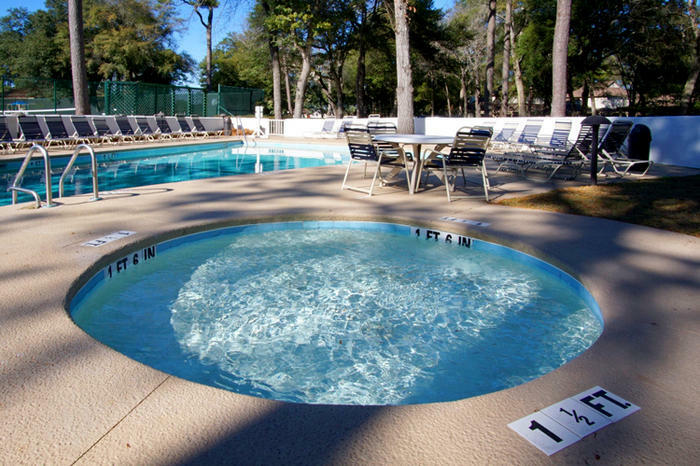 The resort has amenities besides swimming pools as well, including an on-site restaurant and game room, so your North Myrtle Beach vacation can include exactly as much travel as you want. Make a reservation at Ocean Creek Tennis Villas for a South Carolina beach vacation that will become one of your favorite memories. Elliott Beach Rentals is not affiliated with onsite management or the HOA of Ocean Creek Tennis Villas.